Journal keeps a record of any interaction that you want to remember — even something that is not located on your computer, such as a phone conversation or a paper letter that you mailed or received. Here's how to find Journal. In the Folder Pane, click the Journal folder. In the New group, click Journal Entry. Note: Previous versions of Outlook included an automatic journal feature which tracked documents opened in other Microsoft Office applications and Windows. 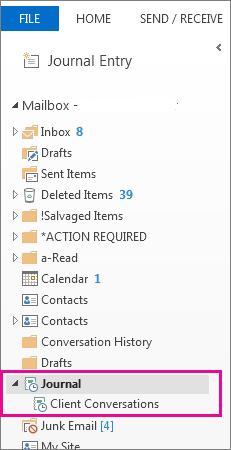 This feature isn’t available in Outlook 2013 or Outlook 2016. In Journal, in Timeline view, click View. In the Current View group, click View Settings, and then click Columns. In the Select available fields from box, click the field set that you want. This normally would be Frequently used fields or All Journal fields. In the Available date/time fields box, click the field that contains the time that you want to use as the start time for the item, and then click Start. In the Available date/time fields box, click the field that contains the time that you want to use as the end time for the item, and then click End. Tip: The Timeline view shows when each item and document was created, saved, sent, received, opened, and modified. When you change the time fields used to display items on the timeline, the location and duration of the items may change on the timeline. Enter a new start date and time. To change the end time, change the number in the Duration box. Note: Changing the times associated with a journal entry doesn’t change the start time of the item, document, or contact that it refers to. Tip: To quickly access Journal, you can add the Journal view button to the Navigation Pane. At the bottom of the Navigation Pane, click Configure Buttons , then click Add or Remove Buttons, and then click Journal. To document the exact start and end time, on the Journal Entry tab, in the Timer group, click Start Timer. The Journal item records the date and length of time that you worked with the contact. Click Pause Timer to stop the clock. To turn off Journal, you must clear multiple check boxes in the Journal Options dialog box. No single option turns Journal off. In the Also record files from box, clear all check boxes. Note: It is not necessary to clear the check boxes under For these contacts. Emptying Journal involves deleting entries. In Journal, on the Home tab, in theCurrent View group, click Entry List. A table view of all Journal entries appears. To choose a single entry Click the entry you want. To choose multiple entries Hold down CTRL, and then click the entries you want. If you want to choose a set of adjacent entries, click the first entry, hold down SHIFT, and then click the last entry. To choose all entries in a folder Click any entry, and then press CTRL+A. On the Home tab, click Delete, or press DELETE. Tip: To quickly access Journal, you can add the Journal view button to the Navigation Pane. At the bottom of the Navigation Pane, click the button, click Add or Remove Buttons, and then click Journal . In the Automatically record these items box, select the check boxes for the items that you want recorded automatically in Journal. In the For these contacts box, select the check boxes for the contacts whose items you want recorded automatically. In the Also record files from box, select the check boxes next to the programs whose files you want to record automatically in Journal. On the File menu, point to New, and then click Journal Entry. Drag the items to Journal . In the For these contacts box, select the check box next to the contacts whose items you want to record automatically. In the Automatically record these items box, select the check boxes next to the items that you want to record automatically. On the Actions menu, click Create, and then click New Journal Entry for Contact. The current date appears in the Journal item header. For a different date, click the arrow, and then click a date. On the Journal Entry tab, in the Timer group, click Start Timer. The Journal item records the date and the length of time that you worked with the contact. Open the contact whose journal entries you want to view. On the Contact tab, click Activities. In the Show box, click Journal. On the Go menu, click Journal. In the Select available fields from box, click the field set that you want. The Timeline view shows when each item and document was created, saved, sent, received, opened, and modified. When you change the time fields used to display items on the timeline, the location and duration of the items may change on the timeline. In Timeline view, click the View menu, point to Current View, and then click Customize Current View. Enter a new start date and time. Note: Moving a journal entry does not change the start time of the item, document, or contact that it refers to. To turn off Journal, you have to clear multiple check boxes in the Journal Options dialog box. No single option can turn Journal off. On the Preferences tab, click Journal Options. Under Automatically record these items, clear all the check boxes. Under Also record files from, clear all the check boxes. It is not necessary to clear the check boxes under For these contacts. Emptying Journal involves deleting journal entries. In Journal, click the entry, and then press DELETE. In Journal, in the Navigation Pane, under Current View, click Entry List. A table view of all the entries appears. Click any entry in the table, and then press CTRL+A, or on the Edit menu, click Select All.